On Sales while supplies last. The MTR-500 70-Volt to 100-Volt Amplifier-Transformer Combiner enables the conversion from an 8 Ohm amplifier output to a 70V/100V. This unit is ideal for both Professional stage or PA applications which require running multiple pairs of speakers to a single amplifier. 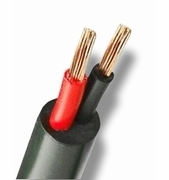 it is ideal when connected to an 8 Ohm amplifier that features a Bridged Mono Output signal. 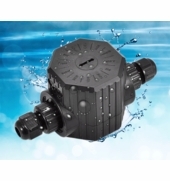 It allows you to convert up to 500 watts Bridged Mono. 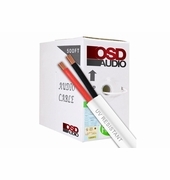 It works well with our OSD AMP300 (470 watts Bridged), OSD AMP200 (350 watts Bridged) and also the new OSD XMP100 (Class D; 150 watts Bridged Mono). So the MTR duplicates the output of the 8 Ohm amplifier connected to MTR Inputs. it does not add any Gain. 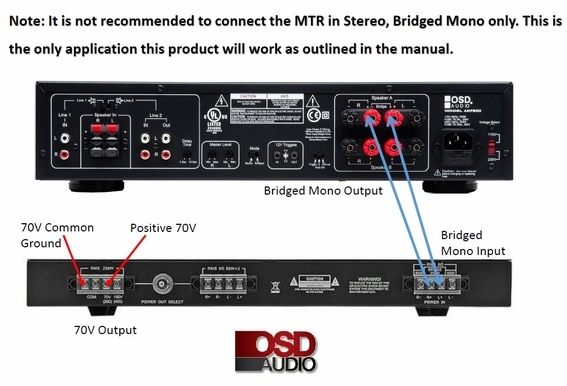 NOTE: IT IS NOT RECOMMENDED TO CONNECT THE MTR IN STEREO, BRIDGED MONO ONLY. THIS IS THE ONLY APPLICATION THIS PRODUCT WILL WORK AS OUTLINED IN THE MANUAL. 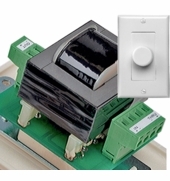 The MTR-500 70V/100V Line Matching Transformer Combiner enables the conversion from an 8 Ohm amplier output to a 70V/100V. 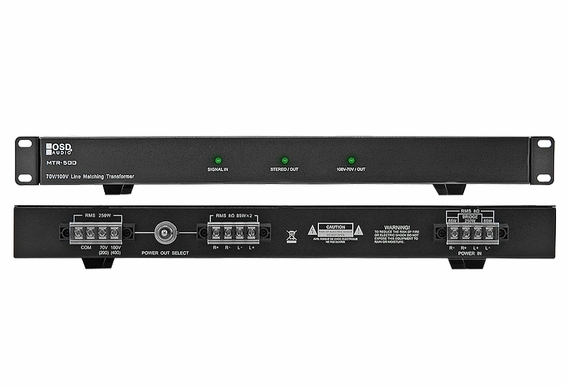 This unit is ideal for both professional stage or PA applications which require running multiple pairs of speakers to a single amplifier. I am currently using a 100 watt PA mixer/amp (with both 8 ohm & 70 v outputs) to drive 4 20 watt 70 v speakers. I am looking to extend the area of coverage by adding 4 more 20 watt 70 v speakers for a total of 160 watts. 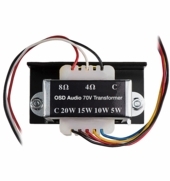 Will I be able to do this with the Amplifier Transformer OSD-MTR-500? Does this device have gain or since my amp is 100 watt the most I will get is 100 watts. 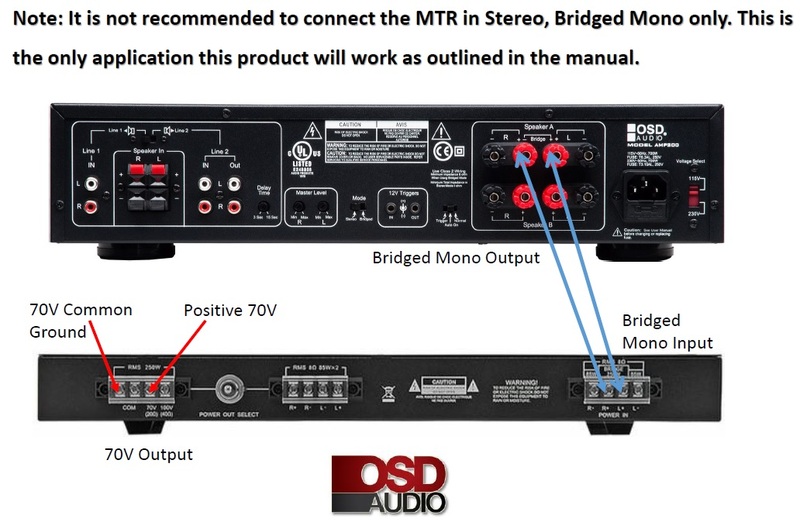 Hi George, You are correct in assuming this amp only converts the power going through it, and will not add any power. 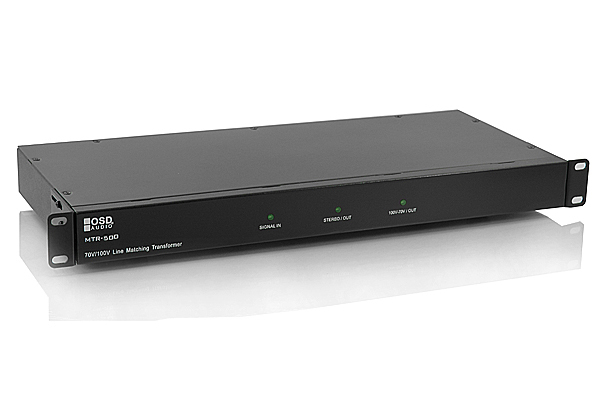 You may want to take a look at the PA270 if you need a 70v amp. Is there an update on when or if this model will be available again? The current ETA is May 2012...which is almost a month ago. Hi Brian, We apologize for the delay. We're still making improvements and are at least 30 days out from delivery. We'd rather delay and produce the best product possible but we are sorry about the wait.